Justine and Ian have been very proud owners of this villa since it was built in 2004. We both work hard all year round and look forward to spending our family holidays over in Spain, chilling round the pool, playing on the beaches or just going out in the car to discover more wonderful places to visit. We both love socialising, eating and having a few cheeky beers with our friends at home and abroad. We found this little haven back end of 2003 and fell in love with it's location, the privacy and the sheer size of the pool for such a small complex. We completed early 2004 and go out several times a year and have never once tired of the place or the people!! Like most people, we live a hundred miles an hour at home, but as soon as the taxi picks us up to go to the airport we both totally just switch off from the day to day stresses. We know that the villa will have been well looked after in our absence, we feel secure if our children are playing out as it's a gated complex, we have everything we need for a wonderful, relaxing holiday, or as relaxing as it can be with 2 children!! Plus love the fact that most of the restaurants are now offering 2 courses for €10 and this usually includes a drink. En-suite bathroom to bedroom 1 with shower cubicle, sink and wc. Family bathroom with bath / shower over, wc, bidet and sink. Both bathrooms have storage units under the sink. Open plan livingroom & dining area, large leather modern corner suite (double sofa bed), 32" flat screen, satellite TV & English channels, DVD player, i-pod docking station. Dining area extendable table with 4 chairs & 2 stools. Aircon & wall heaters. Excellent size kitchen with full size cooker, hob with 4 rings, full size fridge, freezer, washing machine, dishwasher, microwave, toaster, kettle, coffee maker, iron and ironing board. 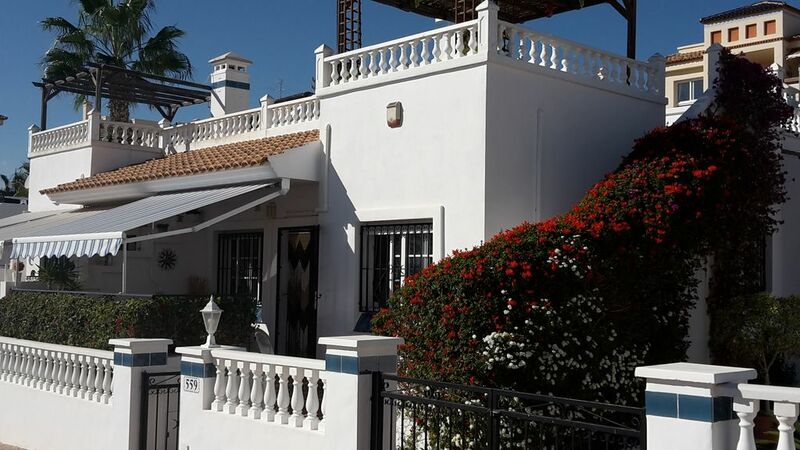 There are 3 major golf courses nearby Villamartin, Campoamor and Los Ramblas all approx 10 – 15 minutes drive away. Notes on accommodation: The villa has been decorated to an exceptionally high standard, and is very well kept and maintained throughout. Outside: Communal swimming pool with children’s area and sun parasols offering shaded areas. Large private solarium/ roof terrace with large marble table and chairs, BBQ and fitted pagoda offering shade. Private garden to the side, and outdoor storage for garden furniture and inflatables. Private extended front patio with shaded area overlooking the communial pool. Cleaning / Towels / Linen / Maid service: All bedding and towels are included (with the exception of beach towels). Other: All prices include Wifi. Large private solarium/roof terrace with large marble table and chairs, BBQ and fitted pagoda offering shade. Excellent suntrap for those cooler months when you still want to get a few rays. Not long back from our latest visit to Orihuela. The area has everything we need for a relaxing break with plenty of bars and restaurants within easy walking distance. This bungalow however is by far the best property we have stayed at with an excellent layout and all the facilities you could want. Very clean with neighbours who are on hand to assist you if required but not overbearing. Would definitely recommend this property to anybody and if we come back to this area will be looking to stay here again. We had a lovely stay. We know the area well having been many times. We hired a car as we were going travelling but you really wouldn’t need it. There are lots of bars and restaurants within walking distance. The bungalow itself was clean with everything you need including lots of sun beds and inflatables for the kids. We loved that the pool was outside the front door. It was big and clean with little umbrellas for those who like a bit of shade. The apartment is fully air conditioned too which is great. Booking was made easy with Justine and the neighbours Andy and Jan were really helpful. The only thing I’d say is four people is plenty in the apartment as the sofa bed isn’t suitable for more than a night or so. Overall I’d definitely recommend staying here, it’s a lovely area and very safe. Had a great time at this bungalow with my family of 5! It is lovely inside and out and has absolutely everything already there so feels like a home from home. Situated in a nice and quiet gated community and is a short walk from plenty of places to shop, eat or drink. The owner Justine is also the most personable and pleasent owner we have had the pleasure of dealing with. Will definitely be staying here again. Excellent apartment/bungalow with everything you could possibly need. The apartment was clean, well equipped and had fans and air-con in the living room and bedrooms. Everything you could need is there, even laundry and dishwasher tablets (though we had brought our own anyway), as well as inflatables for the beach and pool etc. The shaded area of the roof terrace was a nice place to eat in the evenings. The pool was great, plenty deep enough and nice to swim in late at night when it's nice and quiet, though it's not too busy that you cant swim during the day as well if you wish. There are plenty of places to eat within a few minutes walking distance, the restaurant run by the Hungarian family was particularly nice, best to turn up early or book in advance though, their tapas offerings were very tasty. The huge La Zenia open-air shopping complex is just down the road, thousands of FREE parking spaces are available, it's well worth a visit, though it was very hot in late-August, so finding the shade was a priority. There are however plenty of small mist-jets blowing a fine water spray throughout though which is nice on the hot days. Some good places to visit are Terramitica for the kids, great theme park. Snorkeling at Santa Polar (about 30 mins drive), this was amazing and we all enjoyed it very much. La Zenia beach is just 5 mins away by car, and was very nice, the water stays quite shallow for a fair way out, so very safe for the kids, but go far enough and it obviously does get deeper. Supermarkets are just a few minutes away by car, you could probably walk to them, but then you'd have to carry everything back, quite heavy if you're buying drinking water! We had a great time. Thank you to Jan and Andy next door who helped out with any questions we had. It's quite reassuring to have someone English to call on if you need to, not that we did need to. I would recommend a hire car if you have kids so that you can go further afield and do more, but if all you want is to relax by the pool, you could do without. Complex was safe and secure, and quiet at night. All in all a very good holiday made even better by the great accommodation, a special mention is in order for the memory foam mattress and pillows in the main bedroom, very comfortable indeed. Thank you so much Andrew for taking the time to write a review, you have included some very useful information for visitors that haven't stayed in the area before and some lovely feedback about bungalow, our complex, our neighbours and the surrounding area. If you would like to book again in the future please don't hesitate to contact me. Great communication with owner and key holders. Outstanding information about house, area and things to do. Apartment was very nicely decorated, modern and clean. Memory foam mattress in the master bedroom was lovely. Nice and big sun terrace, and spacious outdoor area. Very quiet at night, a bit more hectic around the pool during the day. We went to the beach most days. A lovely holiday altogether. Everything was as described and very clean. We had a wonderfull time staying in the house. Thank you so much Johann for your kind words and taking the time to write the review. As we are always looking to improve the property to ensure everyone has a pleasant and memorable experience can you please let us have any feedback on how we can improve the property to get 5 stars if you were to stay in the property again. Only 20 mins stroll to the local sandy beach Playa Flamenca, but many many more within a short drive all the way down the beautiful sandy Orihuela Costa. 20 mins drive from Murcia airport, and 40 mins from Alicante. Car hire is recommended or transport can be arranged to and from the airport, we can also provide you with contact details for a local taxi. Main commercial centre is 5/10 mins walk, nearerst shop 5 mins walk, nearest large supermarket approx 15 mins walk, 20 mins to local beach. Nearest bar / restaurants 5 mins walk, local infamous Saturday market 15 mins walk. Cash machine 5 mins walk, various banks within a small drive. Booking Notes: Please contact Justine for availability. £100 non refundable deposit is required at the time of booking and the final balance will be due 4 weeks before departure. There is a €60 charge which is payable locally for the clean Changeover Day: We will try and accommodate flexible change over dates, please contact the owner for any requests. Notes on prices: Minimum Charge of £150 applies. €60 per family is payable locally for laundry of towels and bedding and cleaning of the bungalow. If your arrival is after midnight, there is an additional €10 charge which is payable locally.